Last month, I told you about a very few of the hundred plus Port Maitland postcards I have collected. Today, you will learn about five more from my collection. 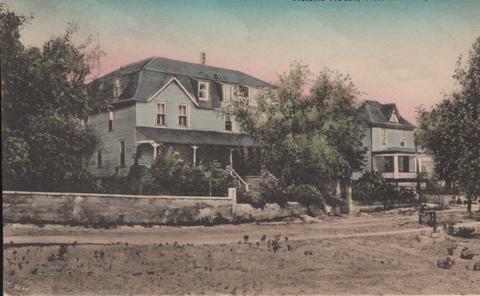 The "Willow Dale" at Beckley Beach, not to be confused with the "Willow Dale Home" on the west side of the river was another establishment where many tourists chose to spend their vacations. I am particularly interested in this vacation spot as it is the house where I grew up. It is now gone, torn down in 1969 by my father Maurice. 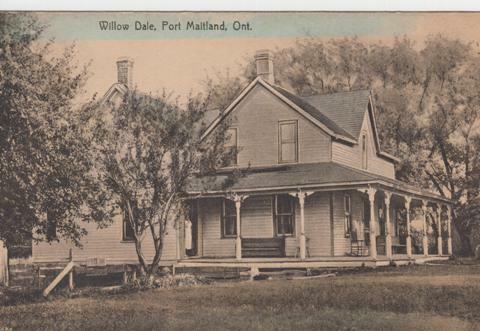 Built for John and Henrietta Siddall, as a boarding house, this home became known as "Willow Dale". A 1920's advertisement, produced for the TH&B tells us Mrs. Siddall is the proprietor of Willow Dale. The advertisement provides a passenger train schedule from Hamilton to Port Maitland. It also includes a list of hotels and boarding houses. A room at Willow Dale, can be rented for $2.50 a day, or $14.00 per week. Acting as agent for the Canada Coal Company, Carroll Kenney purchased Willow Dale in approximately 1933. My family moved into Willow Dale around 1954. My father rented the front portion for a couple years. He then purchased it from Canada Coal in 1955. I recall the property being surrounded with very large and old willow trees. They had become dangerous and dirty, so Dad had Don Clark of Marshville, remove them in 1958. On the west side of the river, was another similarly named lodging house, the "Willow Dale Home." On the face of the postcard it boasts meals and lodging. 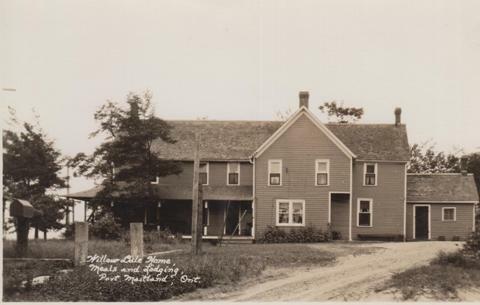 After selling the Willow Dale boarding house, at Beckley Beach to Canada Coal, Henrietta Siddall purchased this very large building, built and owned by Bill Ward. The YWCA from Hamilton had previously used it as a summer camp before opening Camp Owaissa, just east of Beckley Beach. Staying on the west side we find a postcard featuring the "Victoria House", located where Joe Flatt now runs his live bait and tackle shop. On the back of this card is a simple note that leaves one pondering its meaning. It is postmarked at Stromness on September 2, 1909, and was sent to Mr. Ernest Spellman c/o Morgan Flynn, Clay Street Lima NY. It reads "Well Ernest. I am still on the continent." Signed J.M.D. This note interested me because of the name Spellman, a Stromness family. I believe Ernest was in his teens in 1909. There are probably more postcards of the pier and harbour than any other single card. Over the years, there has been a series of piers. However, until researching the TH&B's railway car carrier the Maitland One I was not aware a new pier was build in the 1913-1914 era. 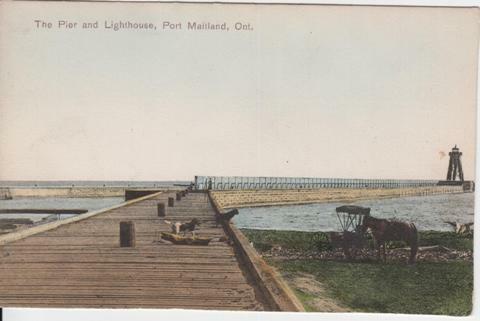 A postcard postmarked at Port Maitland and dated August 13, 1914 is titled New Pier and Light House, Port Maitland Ont thus, opening the opportunity to do more research. You can see from the card the similarity between the present lighthouse and the one shown in the card, because it is the same lighthouse. Today it is closed in and looks a bit sturdier. There are postcards showing a few of the local cottages. In one we see the view looking west from the property of Karen Redding in Beckley Beach. In it we see the former cottage of Father Jim Ford. It is presently owned by Fred and Roberta Cash. Beyond the Cash's we see the cottage once owned by Robert Lavelle. This cottage was badly damaged in a storm on December 1, 1985. A new one built across the road from the original and now belongs to Patricia Bleach and Kathleen Randall. Beside Lavelle' s we see Mrs. Dunn's cottage. It too has been moved across the road to higher ground and is now owned today by Tom McNally. I'll be danged if I can learn Mrs. Dunn's first name! "Willow Dale Home", West Port Maitland. "Willow Dale", East Port Maitland Lizzie McCane standing in the door. Victoria Hotel Port Maitland after new dormers.